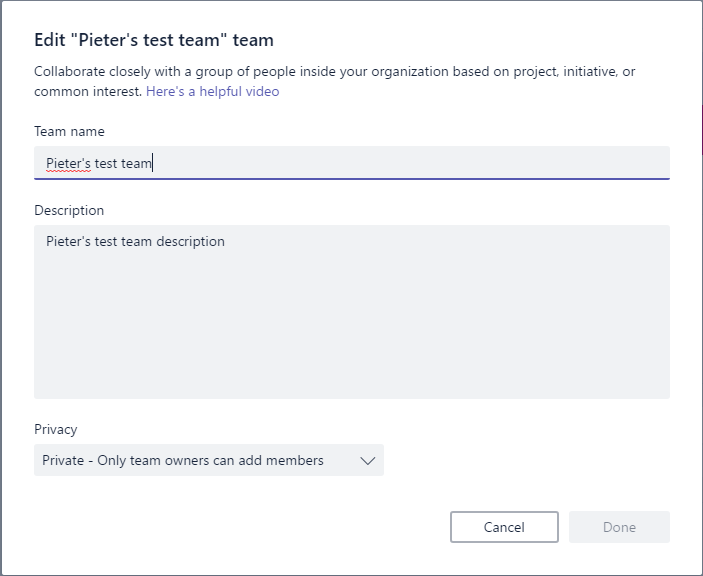 Ok, so you’ve created your first team and now you would like to configure the team. Where do you go? In this post I’m going through the settings available within the app. But this only offer me to change the name, description or the privacy settings. 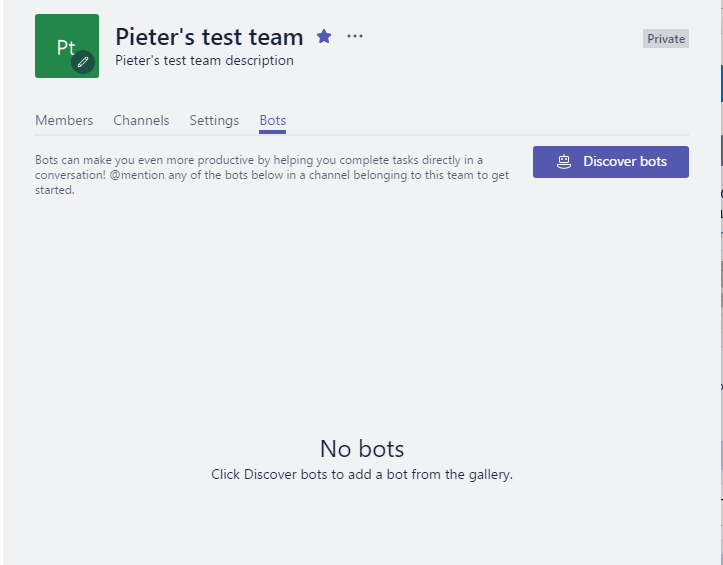 Click on the team name in the breadcrumb (in the above screenshot Pieter’s test team). And not just the Settings, but also the Bots option. 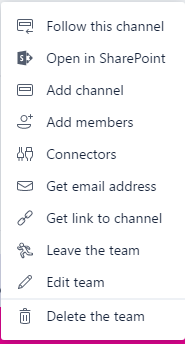 Yes, I did notice Member and Channels but those options you can find in other places in Microsoft Teams as well. Notice that the scroll bar on the right only appears when you start scrolling down. This scroll bar disappears when you stop scrolling. Well at least this is a good interface without the much hated scrollbars. So now you can add a Bot. 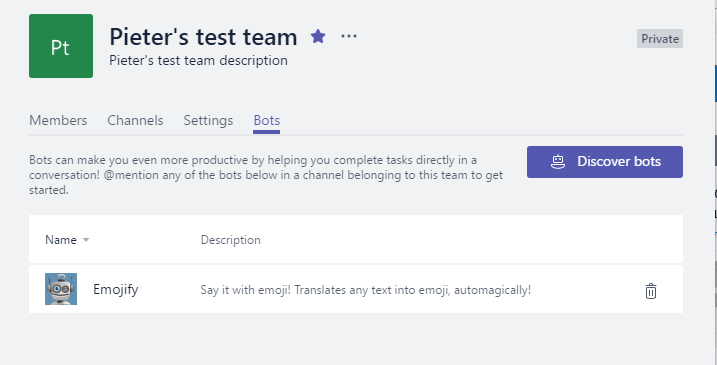 I’m picking the Emojify bot. So where do I find this bot now? 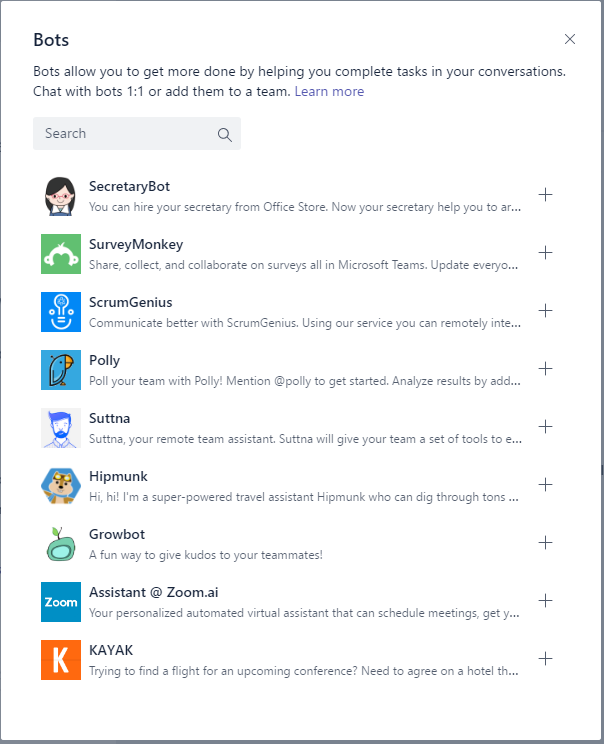 Within the Chat section you will have to search for the name of the bot. I’m not sure if any user would find this. but after a while things seem to start working and my conversation is being updated. 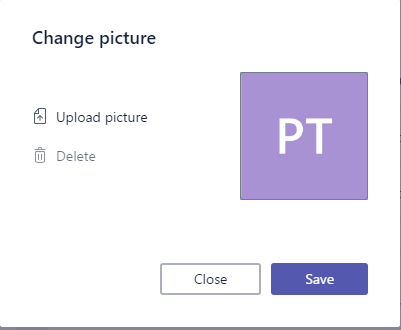 In the Team picture settings you can update the team picture. Who would have guessed that? If you upload a photo and then delete the photo you might find that the color scheme of your site changes. In the Member permission section you can decide what members can do within your team. Ok, let me first explain the different permission levels. Members – people internal to your organisation that have been given member permissions to the team. Guests – people that are not part of your organisation or people that use accounts that are not part of your domain. 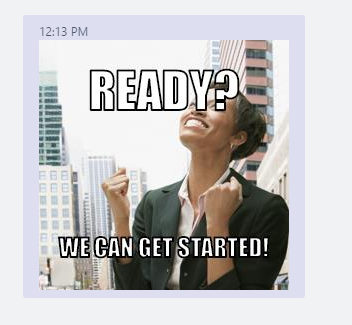 So now we are looking at what members can do. 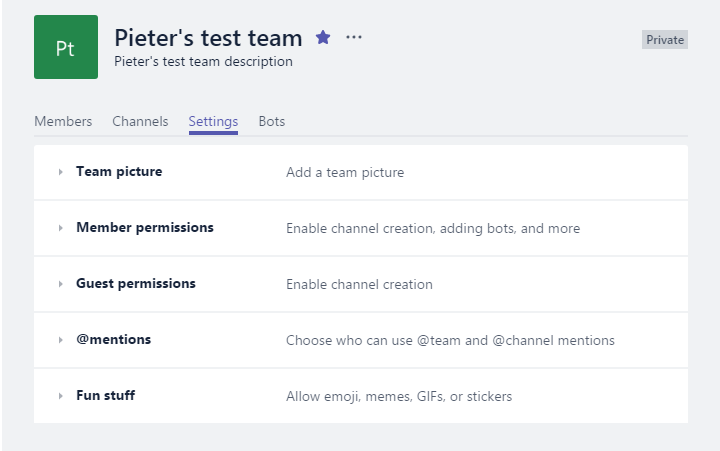 Do you want your team member to be able to create or add new channels? 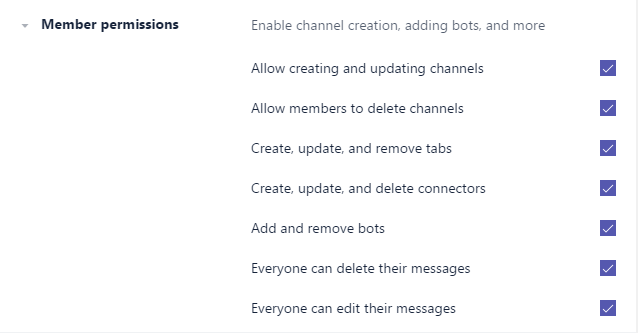 Should it be possible for members to remove the channels. Should it be possible to add new tabs to the team? 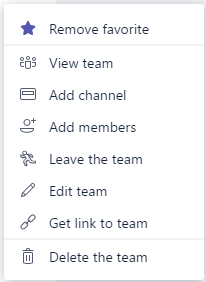 Should it be possible to add connectors to the team channel. Can everyone delete their own messages? This is a bit of bad wording as everyone implies that this includes guests. Can everyone edit their own messages? This again is a bit of bad wording as everyone implies that this includes guests. Also note that all of the above is switched on. Many paranoia administrators will probably want to untick all the boxes. But the new approach is to empower users. So give them the options to do all of the above. Do you want your guests to be able to create or add new channels? Should it be possible for guests to remove the channels. Note that for guests both of the above options are disabled by default. 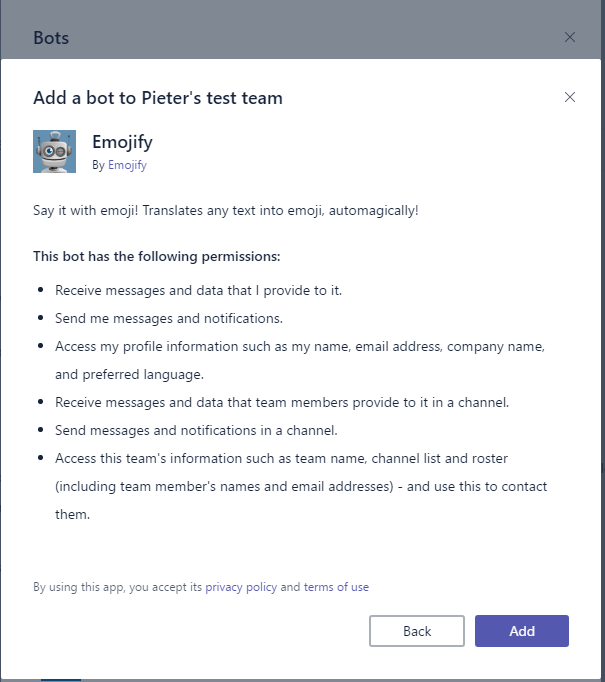 In the mentions section the owner of a team can decide if mentions in messages are allowed. As these mentions would trigger notifications the options to disable notifications have been added. 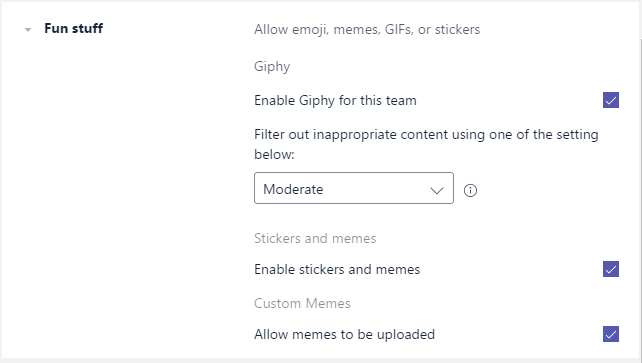 This is where you can find settings for Giphy, Stickers and Memes. 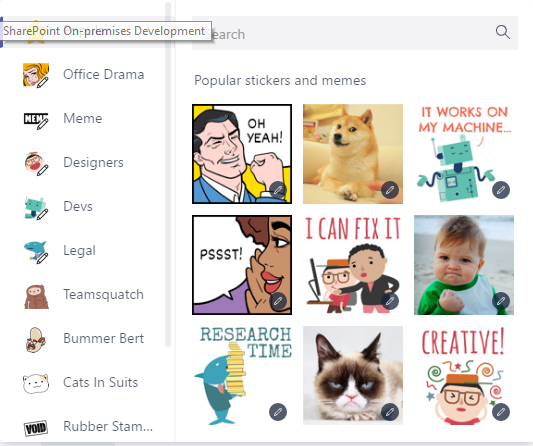 Giphy’s, Stickers and Memes can be added to conversations. If you don’t want users to use these then you might want to untick the above boxes. But hey, why would you not want to allow this? Remember this is the Fun stuff!